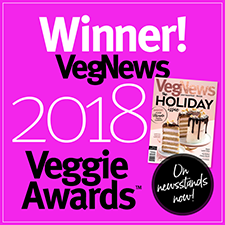 Vegetarian Plus has transformed one of the world's most popular foods into a healthy and delicious vegan option with their Vegan Tuna Rolls! Versatile and able to replicate chunk tuna in all of your favorite recipes with amazing similarity, it makes delicious sandwiches, savory casseroles and flavorful salads. 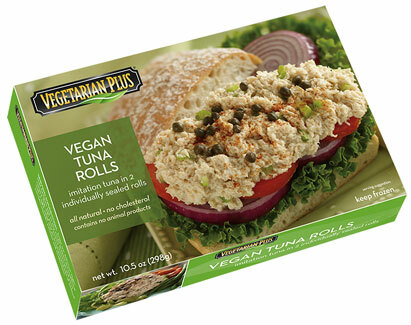 Just use in place of real tuna in all your favorite recipes and enjoy the flavors and textures without the fish! 12 oz. (340g) packages are $6.99 each. From brenda king of augusta, Georgia on 1/22/2019 . 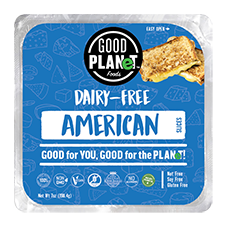 Has anyone tested this to verify it's Vegan? seriously! It taste just like what I remember a Tuna salad sandwich tasting like (25years ago). I didn't try it right out of the package, I waited until I had it all mixed it with standard tuna salad ingredients (vegan mayo, mustard, chopped onion, celery, sweet & dill pickles & black pepper ). I thought it might be soupy'isk after defrosting but it wasn't. I will order again & again. I can't wait to try it in a casserole. From Richard Natoli-Rombach of Rochester, New York on 1/12/2019 . This is the closest thing I have ever found for making a tuna mayonnaise salad or sandwich. It tasted like I remember decades ago when my mother made tuna mayo sandwiches. From Yolanda Pavey of Coeur d Alene, Idaho on 1/7/2019 . Not perfect texture but the flavor was excellent and we enjoyed every bite. One daughter even went for seconds!! From Richard Rankin of Kirksville, Missouri on 12/6/2018 . This is terrific stuff. The texture isn't exactly like canned tuna, but it's close, and the flavor is spot on. I made tuna salad sandwiches, and a tuna casserole, and they were great. If you used to like canned tuna, this stuff is for you! From Cassidy of Salisbury, Maryland on 12/4/2018 . Holy moly! I've had this in my freezer for a little bit because every other tuna alternative I've ever tried is a huge letdown. I just thawed out a bit because I was really craving a tuna sandwich and mixed it with just some vegan Hellman's, S&P, and lemon juice. This is UNREAL. I haven't had a tuna sandwich like this in years and this will absolutely be a regular item for me when ordering now.